Hippo CMMS, MMP’s sister company, is not your average Computerized Maintenance Management System (CMMS) business. 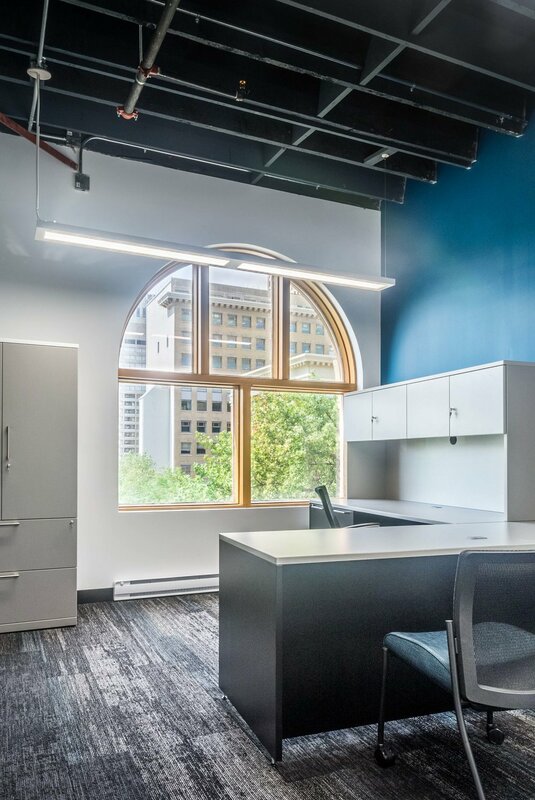 With their renovation of the 4th floor at 123 Bannatyne Ave., the Hippo Management team hoped to provide an uplifting and creative workspace for their 20 young and energetic staff. The overall concept was to maintain the character of the 100 year old building while providing a modern industrial feel. The Hippo CMMS team moved from their temporary space into their new space last week. 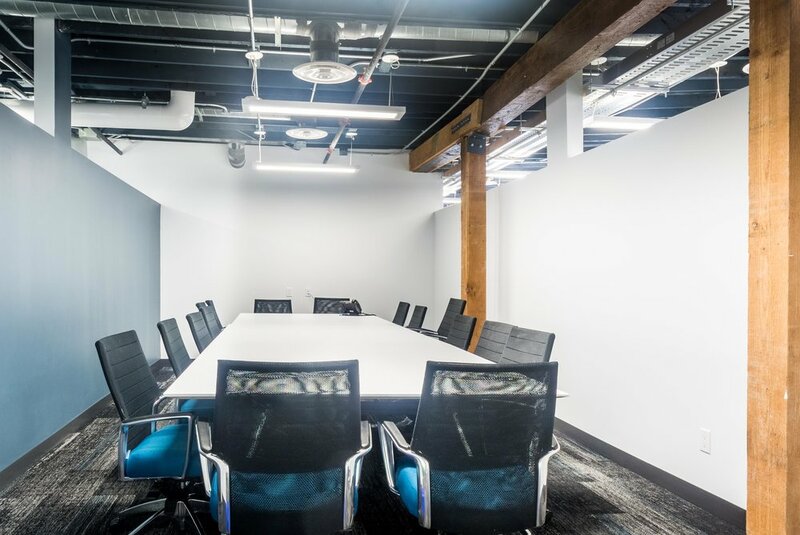 Their newly renovated office now features multiple gathering spaces and breakout rooms for casual meetings, a large boardroom for more formal meetings, and height adjustable desks for all staff. 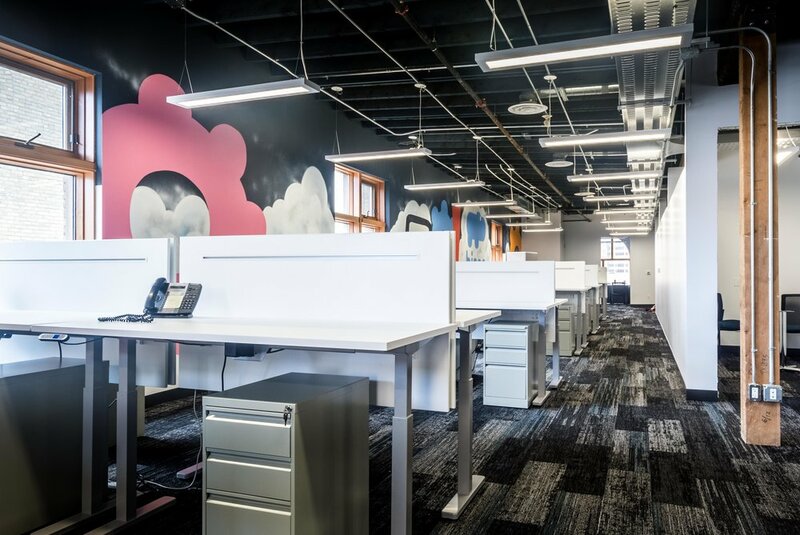 The renovation ties in Hippo’s brand identity through the inclusion of a number of feature walls in Hippo blue, as well as through a 75+ foot mural painted by Winnipeg’s Grafitti Gallery curator and artistic director, Pat Lazo. Please see above for a few photos of the newly renovated Hippo CMMS space. The Scotiabank Technology Centre is a large state-of-the-art computer facility located within the Asper School of Business’ Drake Centre at the University of Manitoba. The renovation of the existing computer lab and an adjacent classroom was completed by MMP Architects to allow for project completion that aligned to the start of the fall 2017 semester. 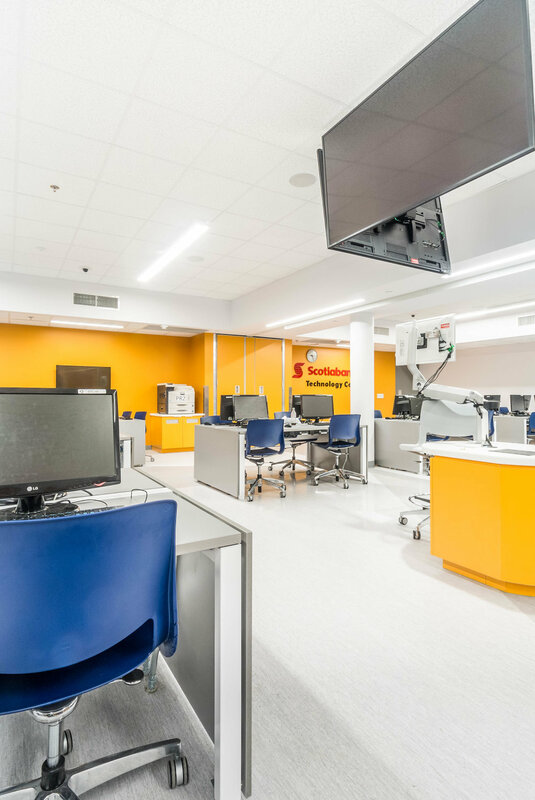 Renovations to the space were based on the MIT’s TEAL (Technology Enable Active Learning) teaching format that merges lectures, simulations, and hands-on experiments to create a collaborative learning experience. Achieving this style of teaching in the new space required extensive electrical coordination amongst the project team. The newly renovated facility houses 72 computer stations, which are arranged in pods of 4 to allow for collaborative group work. A centralized podium gives the instructor the ability to display relevant lecture information on the LCD monitors throughout the space, as well as on each of the student monitors, and also allows the instructor to access lighting and sound controls. 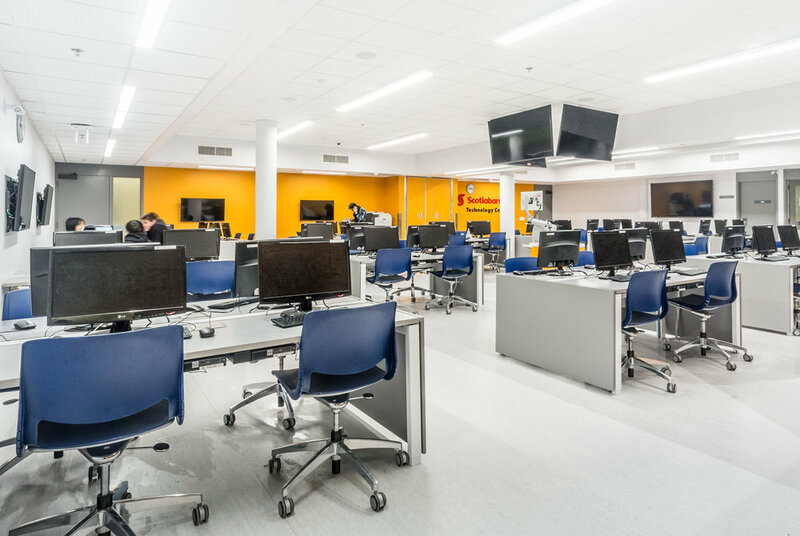 A movable partition was also installed in the centre of the space to allow for part of the lab to be open to students while smaller classes are in session. The resulting fully accessible space is flexible for instructors, students, and administration alike. The newly renovated Scotiabank Technology Centre will be a valuable space for teaching and learning for many years to come. 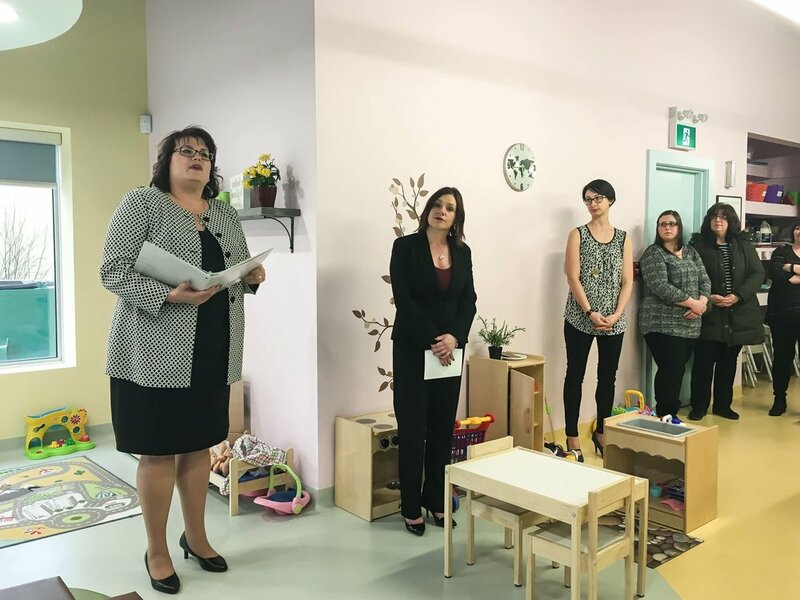 The Windsor Park Children’s Care Centre, Stepping Stones, is a new 4,500 square foot daycare expansion. MMP was engaged in 2013 to renovate an existing office space located at 2-282 St. Anne’s Road into a child care centre for 16 infants (aged 0-2). The MMP team was pleased to attend the grand opening of Stepping Stones last week. 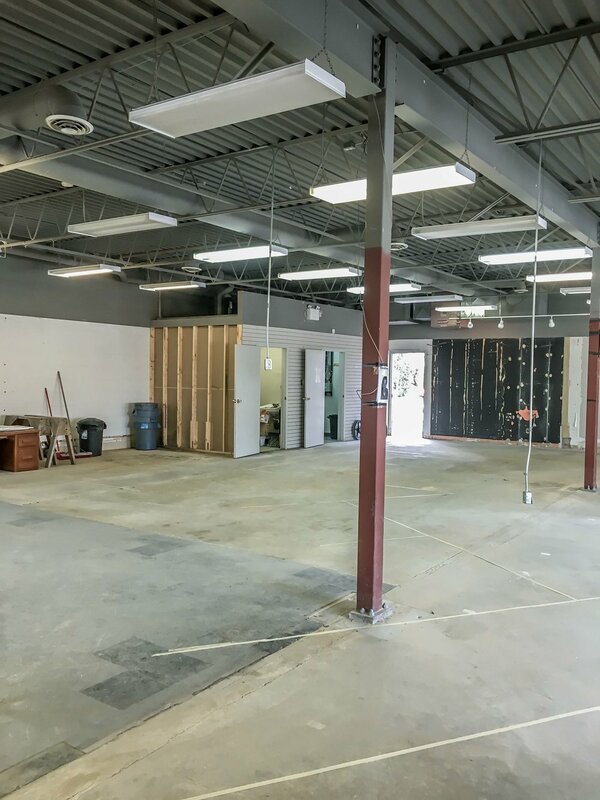 Taking over an existing office space provided some cost saving opportunities through reuse of a front office storage area and various bulkheads. The interior was further enhanced by adding and enlarging windows, adding additional suspended lighting and bulkheads, and applying a light and serene colour palette. The resulting new space provides a calm and nurturing environment for young children to play and interact with each other. Executive Director, Michelle Welch, MMP’s main point of contact for the project, commented that the children are always happy when they enter the space and are eager to partake in activities. This comment affirms to the MMP team that the overall design intent was successfully achieved. 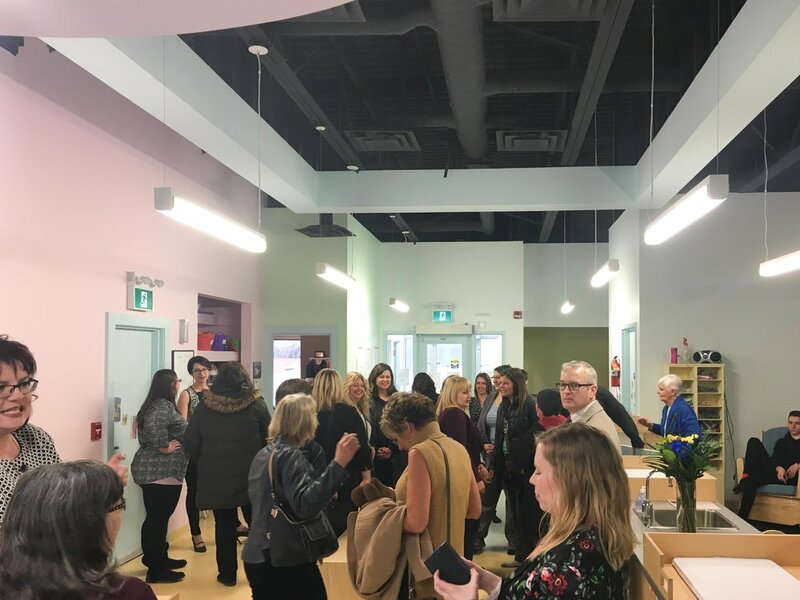 Throughout the process of this renovation, we have developed a growing relationship with the staff of the new daycare and are pleased to have been a part of their expansion team. We wish them all the best with their new facility, Stepping Stones. The interior and exterior renovation of Tacium Vincent and Associates’ new office space is nearly complete. 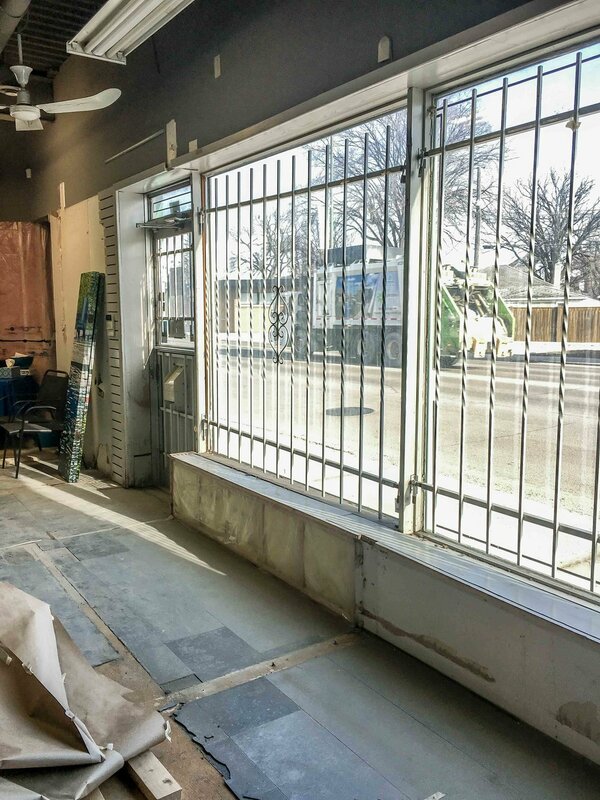 Located in the former Video Cellar building at 206 St. Mary’s Road, the transformation from a teal and yellow building to a modern tile, longboard, and aluminum paneled exterior in neutral greys and warm wood tones has been drastic. The interior renovation of the 3,000 square foot space has been significant as well. A centralized work area was created with private offices circling the perimeter. 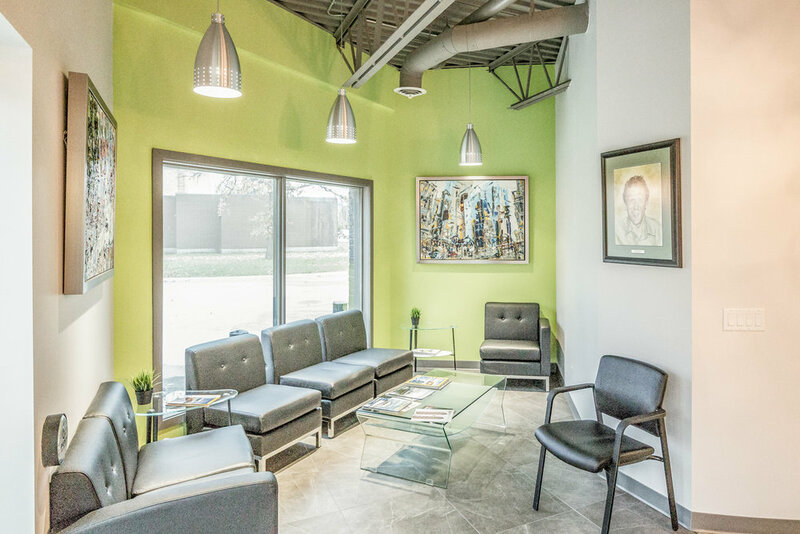 A new reception area, board room, staff rooms and washrooms were all added and finished in greys with leafy green pops of colour and wood accents to add warmth to the space. 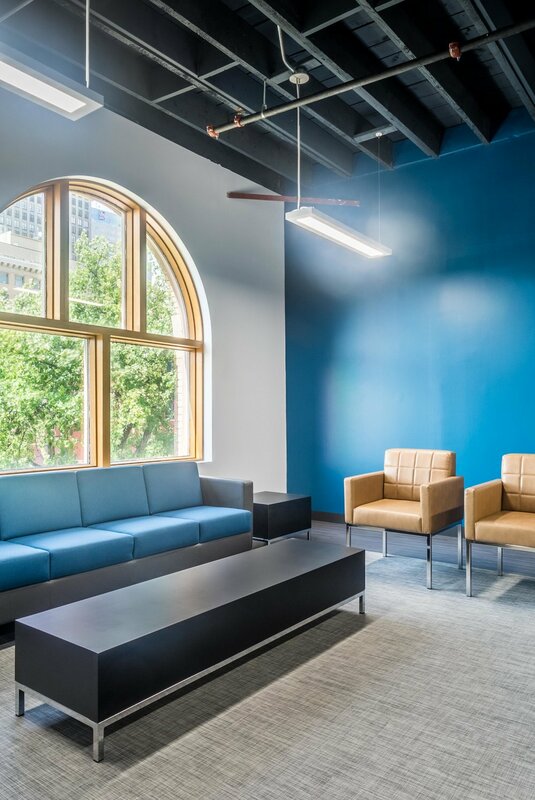 An industrial look was created within the modern space through the salvaging of existing storefront glazing in the board and staff room spaces. A major challenge of the renovation was its proximity to a high school, and the tendency of the building to be a target for graffiti. All exterior materials used are graffiti resistant, so that spray paints can easily be wiped off the face of the building. The longboard wood exterior application was also used to reduce visibility of staff inside, decreasing the amount of glare, as well as increasing building security. The interior and exterior spaces are on track to achieve a December 2016 completion. Please see above for a few photos of the space and stay tuned for final exterior photographs which will be added in the coming weeks.